Steven offers a FREE first / introductory lesson! I have taught classical guitar for over 25 years. I'm a qualified teacher of music and studied at Trinity College of Music. I have a BEd and LTCL. I have a recent Enhanced DBS Certificate. During my time at Trinity I took part in masterclasses with John Holmquist and Gilbert Biberian. Following on I studied privately with John Mills. After leaving Trinity I undertook a full-time B.Ed. Music degree at Middlesex University so I have full Qualified Teacher Status and can teach music theory, ear training, harmony etc… alongside guitar. I worked with a guitar quartet at this time releasing a cd "Cuban Landscape with Rain". Since then I have been teaching the guitar privately, in schools and colleges, and at the Spanish Guitar Centre in central London, alongside university lecturing on music. I now teach at my home in picturesque Little Venice, a two minute walk from Warwick Avenue underground station on the Bakerloo line, and at a secondary school in north London. I'm a full Member of the Incorporated Society of Musicians so have full public Liability Insurance. 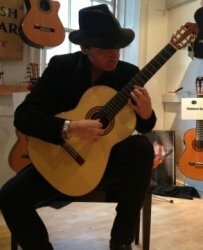 I have over 25 years’ experience teaching the classical or Spanish guitar to individuals and groups of all ages with a 100% pass rate with my students in grade exams, most of whom achieved a merit or distinction. I teach students from complete beginner to diploma level, and particularly enjoy helping beginners develop their musicality and a stable technique, in a friendly and relaxed environment.